The LHCb (Large Hadron Collider beauty) experiment is one of seven particle physics detector experiments collecting data at the Large Hadron Collider at CERN. LHCb is a specialized b-physics experiment, designed primarily to measure the parameters of CP violation in the interactions of b-hadrons (heavy particles containing a bottom quark). Such studies can help to explain the matter-antimatter asymmetry of the Universe. The detector is also able to perform measurements of production cross sections, exotic hadron spectroscopy, charm physics and electroweak physics in the forward region. The LHCb collaboration, who built, operate and analyse data from the experiment, is composed of approximately 1260 people from 74 scientific institutes, representing 16 countries. As of 2017, the spokesperson for the collaboration is Giovanni Passaleva. The experiment is located at point 8 on the LHC tunnel close to Ferney-Voltaire, France just over the border from Geneva. The (small) MoEDAL experiment shares the same cavern. Measuring the branching ratio of the rare Bs → μ+ μ− decay. Measuring the forward-backward asymmetry of the muon pair in the flavour-changing neutral current Bd → K* μ+ μ− decay. Such a flavour changing neutral current cannot occur at tree-level in the Standard Model of Particle Physics, and only occurs through box and loop Feynman diagrams; properties of the decay can be strongly modified by new Physics. Measuring the CP violating phase in the decay Bs → J/ψ φ, caused by interference between the decays with and without Bs oscillations. This phase is one of the CP observables with the smallest theoretical uncertainty in the Standard Model, and can be significantly modified by new Physics. Measuring properties of radiative B decays, i.e. B meson decays with photons in the final states. Specifically, these are again flavour-changing neutral current decays. Tree-level determination of the unitarity triangle angle γ.
Charmless charged two-body B decays. The fact that the two b-hadrons are predominantly produced in the same forward cone is exploited in the layout of the LHCb detector. The LHCb detector is a single arm forward spectrometer with a polar angular coverage from 10 to 300 milliradians (mrad) in the horizontal and 250 mrad in the vertical plane. The asymmetry between the horizontal and vertical plane is determined by a large dipole magnet with the main field component in the vertical direction. The vertex detector (VELO) is built around the proton interaction region. It is used to measure the particle trajectories close to the interaction point in order to precisely separate primary and secondary vertices. The detector operates at 7 millimetres (0.28 in) from the LHC beam. This implies an enormous flux of particles; The VELO has been designed to withstand integrated fluences of more than 1014 p/cm2 per year for a period of about three years. The detector operates in vacuum and is cooled to approximately −25 °C (−13 °F) using a biphase CO2 system. The data of the VELO detector are amplified and read out by the Beetle ASIC. The vertex locator (VELO) during construction. The RICH-1 detector (Ring imaging Cherenkov detector) is located directly after the vertex detector. It is used for particle identification of low-momentum tracks. Following the tracking system is RICH-2. It allows the identification of the particle type of high-momentum tracks. The electromagnetic and hadronic calorimeters provide measurements of the energy of electrons, photons, and hadrons. These measurements are used at trigger level to identify the particles with large transverse momentum (high-Pt particles). The muon system is used to identify and trigger on muons in the events. b) in the LHCb experiment also revealed the apparent existence of pentaquarks, in what was described as an "accidental" discovery. 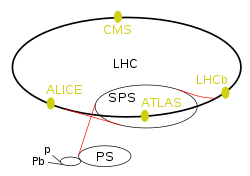 Wikimedia Commons has media related to LHCb. ^ B. Adeva et al (LHCb collaboration) (2009). "Roadmap for selected key measurements of LHCb". arXiv:0912.4179 [hep-ex]. ^ R Aaij et al. (LHCb collaboration) (2013). "First evidence for the decay Bs→μ+μ−". Physical Review Letters. 110 (2): 021801. arXiv:1211.2674. Bibcode:2013PhRvL.110b1801A. doi:10.1103/PhysRevLett.110.021801. PMID 23383888. ^ "LHCb experiment observes two new baryon particles never seen before". 19 Nov 2014.
b→J/ψpK− decays". CERN/LHCb. 14 July 2015. Retrieved 2015-07-14. ^ G. Amit (14 July 2015). "Pentaquark discovery at LHC shows long-sought new form of matter". New Scientist. Retrieved 2015-07-14.